BSS - Canal Side Girls' Campus from Lahore, Pakistan using an avatar in Edorble to give a presentation. It's always been one of our goals to support global classroom connections in Edorble. One of the biggest projects taking place in Edorble right now is AGAP - Advancing Global Awareness Possibilities, a global, collaborative endeavor spearheaded by Allen Nice-Webb, a high school teacher in North Carolina. It involves bringing teachers and students from around the world together to discuss systemic global problems of the students' choosing. We blogged about it here, and we encourage you to reach out to Allen (agapnow@gmail.com) if you're interested in having your students participate. Recently, my co-founder Cederik and I had the pleasure of participating in a few of the AGAP interactions, and we were thrilled to see Edorble being used in such an impactful way. In the gathering I attended, a class of Pakistani girls were using one computer to give a presentation about terrorism in Edorble to an audience consisting of people from North Carolina, California, Italy, and Kazakhstan. Afterwards, I took the opportunity to ask them for their feedback about Edorble so that we can continue to improve it. Cederik was able to drop in on a presentation given by students form Kazakhstan. 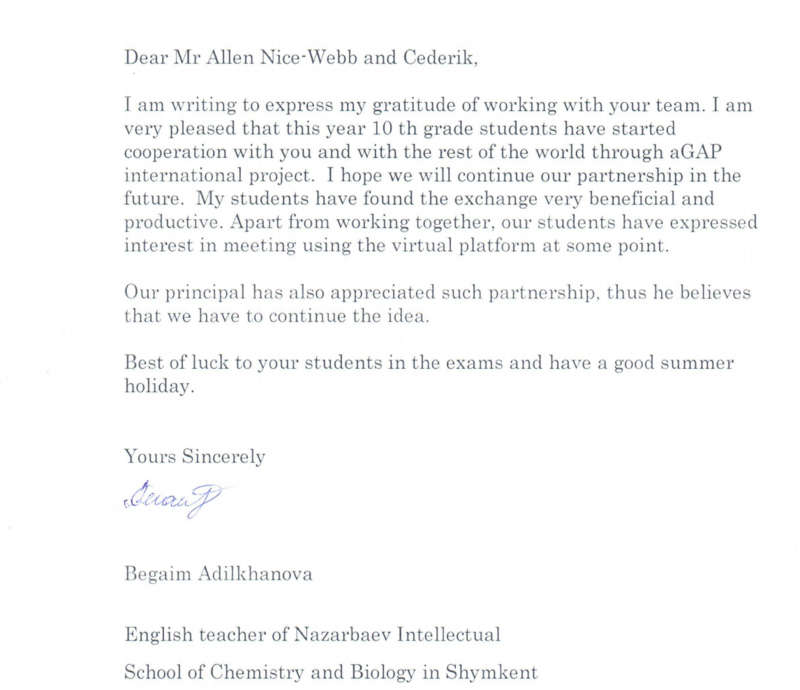 We're thrilled that a teacher from Kazakhstan, Begaim Adilkhanova, had such a positive experience with her students with AGAP that she wrote this kind letter to Allen and Cederik. We've gotten permission from her to share it here. When people ask me, Cederik, or anyone else on our team why we work on Edorble, our first answer is never: "so that we can make a bunch of money as a profitable ed-tech company." The answer is: "because we love helping students, teachers, and trainers come together online". The answer is in that letter from Kazakhstan. If we keep those things as our north star, we think the rest will follow.